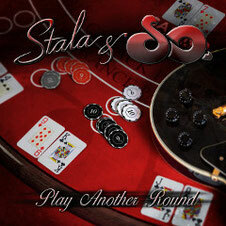 New Release - STALA & SO. Finnish band, Stala & So. was founded in 1997 is known for melodic rock tunes and a positive attitude. They will release their second album "Play Another Round" through Escape Music on April 12. The 70's and 80's glam rock bands, such as Sweet, T-Rex and, Ziggy Stardust in the era of David Bowie, have had a strong influence on the band's image. Stala & So. is making music professionally and also having fun with it. It seems like a guideline for the band as well. In the beginning of 2011 the band became familiar to the Finnish tv-viewing people by taking part in the Finnish Eurovision Song Contest. After the Eurovision show, self-written, recorded and produced debut album "It Is So." was released through the German-based music company, Music Buy Mail, in Europe and South America in September and in October the Japanese record company, King Records, also released it in Japan and South-East Asia. In 2011 the band released a 5 track EP "Gimme Five". The band had the first international tour in Europe - UK, Germany, Belgium and Scandinavia - with Vain (US) throughout March 2012. The songwriting and the pre-production for the new album began immediately after the European tour. The American top-producer, Beau Hill (Ratt, Europe, Alice Cooper, Twisted Sister and Warrant) mixed the first single "Rock Until I'm Done" from the album, was released in November 2012.